Get to know Auckland, the coast of wonderful beaches, and explore the amazing Waitomo Caves in Rotorua. Discover the breathtaking scenery of Mount Cook and Milford Sound, fall in love with Queenstown and tour the enchanting English city of Christchurch. Stop in Franz Joseph and catch the scenic Tranz Alpine Train from Greymouth. International flights: UK - Auckland & Christchurch - UK. Tranz Alpine Train Journey: Greymouth - Christchurch. 1 Breakfast & 2 Lunches. **** Travellers will be required to hold an Electronic Travel Authority (ETA) to enter New Zealand from 1 October 2019. It is a new security and facilitation measure that will help to speed things up at the border and will cost 9NZ$ if processed through the app and 12NZ$ if processed online: https://www.etanewzealand.com/. An International Visitor Conservation and Tourism Levy (IVL) of 35NZ$ is being introduced as a way for international visitors to contribute directly to the tourism infrastructure and help conserve the natural environment. It will be payable on application for a visa or ETA from 1 July 2019. Child rates are available on request (2-11 years). Please contact our customer service team at 02080683176 or customers@exoticca.com. ETA (from October 2019, 9NZ$ if processed through the app and 12NZ$ if processed online: https://www.etanewzealand.com/) and IVL (35 NZ$) (required) drinks, tips and any other services not mentioned in what's included. Arrive at your UK departure airport, ready to board a flight to New Zealand. Night on board. 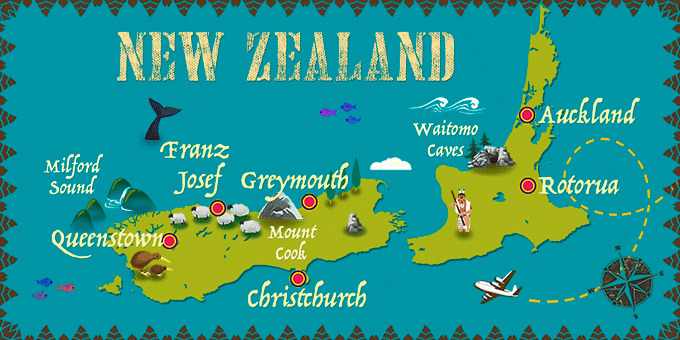 Continue your journey to New Zealand. Arrive in the largest city in New Zealand and transfer to the hotel. Free time to start getting to know this vibrant city. Auckland is located between two coasts and houses a wide variety of beautiful beaches located very near the city. We recommend an optional visit to the Sky Tower, for spectacular views of the city. * Overnight stay in Auckland. Today set off for Rotorua, a city set on a crystalline lake and known for its exquisite landscapes, geothermal activity and Maouri culture. Enjoy a full day tour of the region, including a visit to the famous Hobbit Movie Set, and feel like you've walked into Middle Earth! Enjoy a buffet lunch at the Green Dragon Marquee in Hobitton. Next, be amazed by the Waitomo Glow-Worm Caves, a series of undergrown caves lit from within by thousands of glow-worms. This is truly an unforgettable sight and highlights the abundance of nature in New Zealand. Continue to Rotorua, check-in at the hotel and overnight stay. Spend the day at your leisure, enjoying the landscapes and natural environment. We recommend an optional Te Puia Experience in the evening for a taste of indigenous culture. * Overnight stay in Rotorua. At the indicated time, transfer to the airport for a flight to Christchurch. Arrive in this so-called 'Garden City' and transfer to the hotel. Spend the rest of the day exploring the city, known for its English influence and quaint gardens. Overnight stay in Christchurch. Spend the day getting to know Christchurch at your leisure. We recommend visiting the tranquil Botanic Gardens or soaking up some culture at the Canterbury Museum. Alternatively, experience the best of the region on our optional Kaikoura Tour & Whale Watching Excursion. * Overnight stay in Christchurch. Set off on a scenic drive towards Mount Cook. Admire the diverse farmland and idyllic Lake Tekapo, where you can see the solitary Church of the Good Shepherd, perched on the shore of the lake. Continue along the route of the Tasman River before arriving at New Zealand's tallest mountain, Mount Cook. Transfer to the hotel and overnight stay in Mount Cook. Depart through the spectacular landscapes of Mount Cook National Park, following the shores of Lake Pukaki and entering into the rugged Mackenzie Basin. Make a stop in Omarama, before continuing through the Lindis Pass to admire the fruit growing region of Cromwell and the historic mining region of Kawarau Gorge. Finally, arrive in Queenstown, a city set against the backdrop of the majestic Southern Alps. Transfer to the hotel and overnight stay in Queenstown. Today, travel in a glass-roof coach into Fiordland National Park, home to some of the countries most staggering natural sights. Admire the Southern Alps and farmland along the shores of Lake Wakatipu before arriving at iconic Milford Sound, New Zealand's most famous fjord. Board a boat for a cruise along the length of the fjord, admiring the waterfalls and majestic Mitre Peak. Enjoy a delicious buffet lunch on board as you soak up the landscapes. Return to the shore and travel back to Queenstown. Overnight stay in Queenstown. Set off in the morning towards Franz Josef on a journey of approximately 8 hours, with multiple stops in places of interest such as Lake Wanaka, Haast Pass and Fox Glacier. Arrive in Franz Josef, a small town known for its natural beauty and glaciers. Transfer to the hotel and overnight stay in Franz Josef. Breakfast at the hotel. Today, take the Intercity Bus from Franz Josef Bus Stop to Greymouth, a journey which takes approximately 3 hours 50 minutes, through stunning landscapes and with multiple stops. Arrive in Greymouth, a former gold-mining town, and transfer to the hotel. Spend the rest of the day exploring the town at your leisure. Overnight stay in Greymouth. Today, set off on an exciting scenic train trip on the Tranz Alpine line, which links both coasts of New Zealand. * Travel through lush green landscapes, dry beech forests and soaring mountains and pass by Lake Brunner and the Waimakariri River. Cross the patchwork farmland of the Canterbury Plains before arriving in Christchurch. Transfer to the hotel and overnight stay in Christchurch. * Please Note: You must check-in for your train journey 30 minutes prior to departure time at Greymouth Railway Station, Mackay Street, Greymouth. At the indicated time, transfer to the airport for a return flight back to the UK. Night on board. Passport with a minimum validity of three months from date of return from New Zealand. No visa is required for stays of up to 90 days. An arrival card must be filled in to enter the country. From October 2019, all visitors will require an Electronic Visa to enter the country. 220 / 240 V. A 3-pin plug adapter is required (this is different to the type used in UK). There are no mandatory vaccinations for travellers from EU countries. The free telephone hotline Healthline (0800 611 116) offers 24-hour health advice. Products of animal or plant origin cannot be brought to the country. Anyone attempting to do so will face a severe fine.